This entry was posted on December 24, 2018 by ScienceofSpeed. This is part 1 of 3 into investigations of products to improve engine power output from the second generation NSX. VR Tune Box: This device attaches to the engine's turbocharger pressure sensors, manifold pressure sensor, and camshaft sensor. The device tricks the ECU to increase boost pressure by modifying the voltage the ECU sees from the sensors. The camshaft sensor input allows the device to change the voltage modification depending on engine speed. 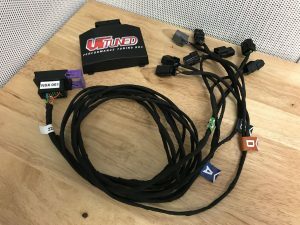 Because the ECU is unmodified, and factory MAF sensors untouched, the factory ECU is relied on for fuel mixture, knock feedback, and other engine control parameters. Because the VR Tune Box doesn't monitor if the engine is warmed up to add power, it has a built-in timer that must elapse before additional boost can be added. Installation: installation requires removal of the engine bay covers. Once the covers are removed, the right side turbocharger pressure sensor is accessed by removing the ECU (the provided instructions indicate to lift and pull the ECU upwards, however, to avoid stretching the factory ECU wire harness, we find it to be safer to simply unlatch the connectors from the ECU and remove it out of the way). Next, to access the left side turbocharger sensor, we recommend removing the interior sound inducer duct, then the valve. Even with these components installed, reaching the sensor can be difficult, so take your time and use care. Once this is complete, the remaining pressure sensor located on the rear of the manifold is easy to access. The camshaft sensor is located at the front left of the engine. Look above the left throttle body, and look straight down. There is another sensor nearby, so make sure to locate the correct sensor. We ran into issues with the camshaft sensor connectors. The connectors provided by Vivid are modified aftermarket connectors because the factory connectors are not available commercially. This results in the connectors popping apart. After discussing with Vivid, a zip tie was used to keep the connectors together. It's not ideal, but a limitation of what's available. Once the harness was installed, it is suggested by the instructions to mount the control box somewhere in the engine bay. We didn't agree with this suggestion because the box containing the circuit board is unsealed. Although the engine bay has panels underneath which should eliminate most water spray into the engine bay - a wash of the engine bay or moisture over time may contaminate and cause a failure of the circuit board. We instead elected to mount the module in the trunk by passing the wire harness through using a grommet. The wire harness would ideally by 6-10" longer to accommodate better routing into the trunk, or a sealed enclosure could be used. Testing: The NSX was tested on ScienceofSpeed's Superflow AWD dynamometer. Because of how sensitive the NSX is to temperature and battery state of charge variables - ScienceofSpeed maintains consistent airflow around the vehicle and monitors various engine parameters including coolant and inlet air temperatures to ensure tests are done under consistent conditions. 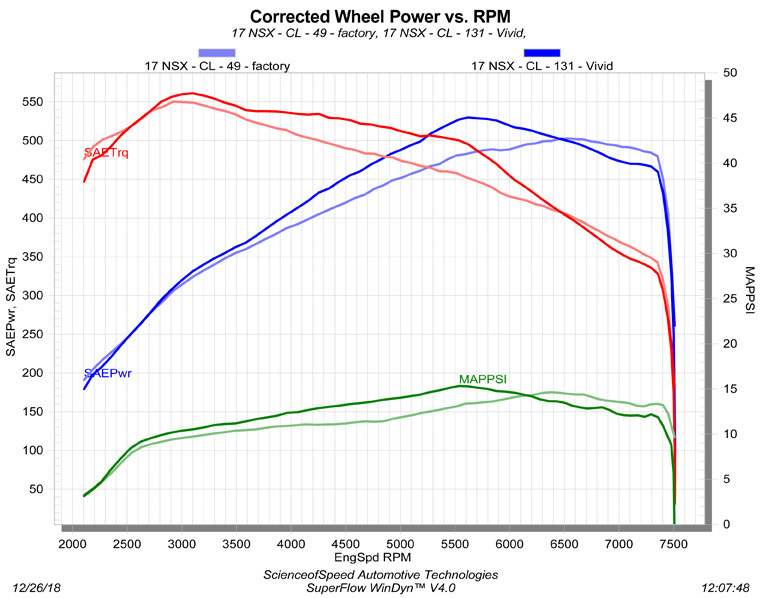 The first chart shows horsepower in blue, torque in red, and manifold (or boost) pressure in green. The average of each test was used. The plot in the lighter shade is factory, and the darker with the VR Tune Box. As you can see, with the VR Tune Box, there is a gain of 82 horsepower compared to the factory test, but the gain is very abrupt and sharply drops to nearly a 100 horsepower loss compared to factory. Looking at the data log from the ECU, we can see why. TPS commanded (in pink) is the throttle angle commanded by the ECU. With the VR Tune box, the throttle is closing after 5500 RPM to nearly 50%. The NSX was removed from the dyno, and a number of data logs were collected on the street verifying the same behavior on the street as compared to the dyno. Despite the throttle closing, the increase in power from 3500-6500 RPM did make the car faster in 60-100 MPH tests by an average of .45-.47 seconds. However, the feel of the engine was like a rubber band - with a big kick down low and then a noticeable drop in power as the engine passed pass 6500 RPM. The 0-60 MPH tests were consistently slower by an .4-.5 seconds - likely caused by the loss in traction from the abrupt hit at 3500 RPM. After verifying knock and inlet temperature was not an issue, ultimately, it was decided that there is likely a torque or mass air flow limiter in the factory ECU software where the ECU detects more air entering the engine than there should be for the commanded turbocharger boost pressure. Vivid confirmed that during tests of their own car, horsepower dropped above 5500 RPM, but their dyno charts are cut off at 6500 RPM, so it was unclear if their results were identical. ScienceofSpeed tested multiple VR Tune Box calibrations using the VR Tune software and settled on a calibration with reduced modification of the MAP sensor signals. 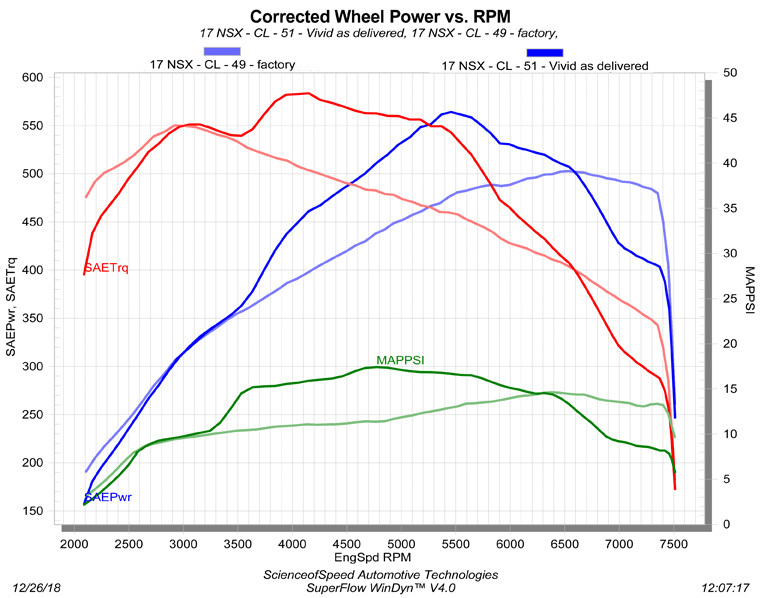 As shown in the dyno chart below, although this produced a lower horsepower gain (42 horspower) - the abrupt torque spike at 3500 RPM is significantly reduced and the power loss at 6500 is reduced to a loss of 25 horsepower. This maintains a close proximity of the factory powerband feel while giving a noticeable increase in power between 3500-6500 RPM. Even with the lower power, the NSX is still .4-.42 seconds faster in 60-100 mph acceleration tests. However, even with the reduced torque spike, the factory traction control system still activates during launch control - resulting in slightly lower 0-60 MPH tests with the VR Tune Box. Conclusion: Although the VR Tune Box did not live up to the 100+ horsepower claims we have seen advertised, the results were noticeable and lead to an average of .45 second improvement in 60-100 MPH acceleration tests. A quarter mile test would be interesting to see if the slower 0-60 MPH yet faster 60-100 MPH results we measured result in faster trap speeds and times. Ultimately, if you consider a piggyback device like this, you should consider the limitations of not having direct control over the ECU. Read on: part 2 - Hydra ECU reflash.